Primary Possibilities: Summer Stock Up! We are so excited to be participating in the "Summer Stock Up" where you can grab some freebies, see products in action and pick up some great ideas in the process! You can pick up freebies that go along with these products by visiting our facebook page and clicking on the tabs at the top! 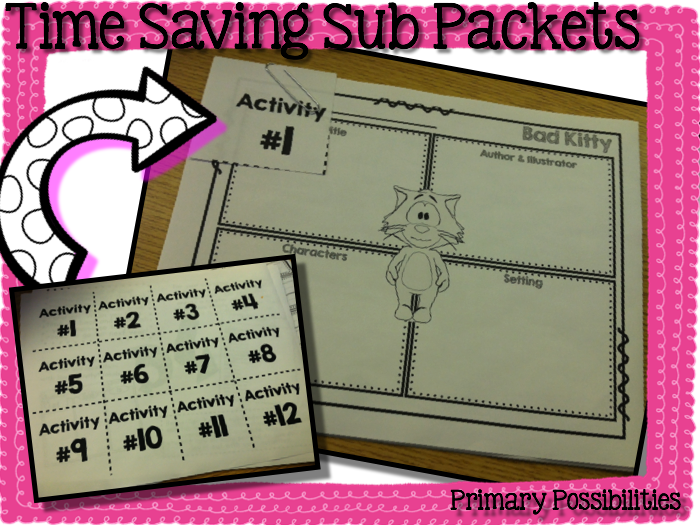 One of the things on my summer to-do list is to create a "Sub Tub" complete with easy to prep sub lessons that go along with children's books that most teachers have a copy of in their classroom. I started with the book "Bad Kitty". 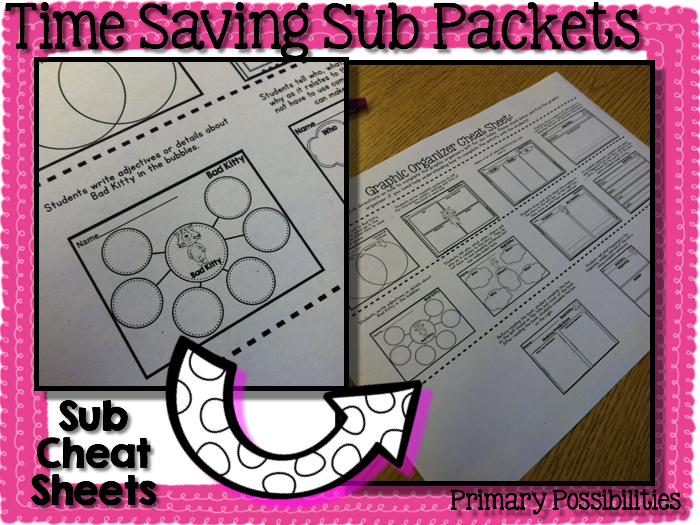 This packet is filled with easy to print graphic organizers that include a "cheat sheet" for the sub. This way you don't have to spend time explaining how to complete the graphic organizer...the directions are all right there! It also included some easy to print & copy math activities. I just copy the printables, label them with an "activity" number and then in my schedule/plans I say what number activity to complete. If you copy the activities ahead of time and have them ready to go, all you have to do is lay them out for the sub. This will be a lifesaver on those mornings when you drag your sick self into school to make plans! There will be more packets, bundles, and a sub binder coming soon to my store! You can pick up this full pack by clicking HERE! Check back for a more detailed post about how I plan for subs! 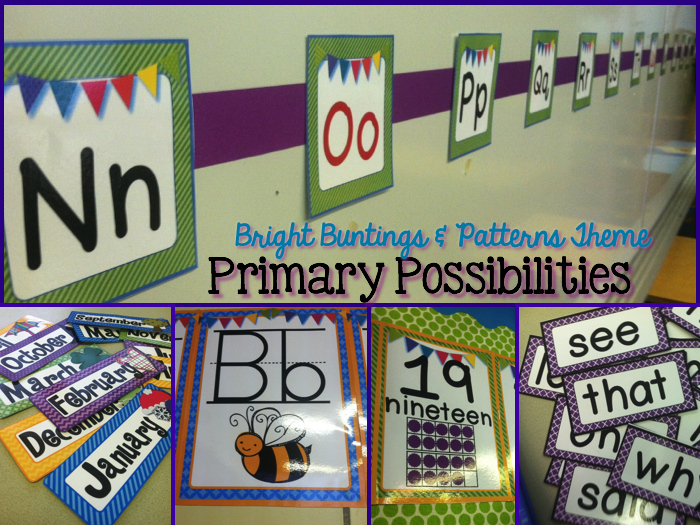 I have created several classroom decor sets but this Bright Buntings & Patterns packet is by far my favorite. I use it in my own classroom and I love how versatile it is! Here are just a few pictures around my classroom to show you the packet in use. You can grab up the word wall headers from this packet over at our facebook page along with the pre-primer word wall cards from one of my Dolch Word Wall sets! 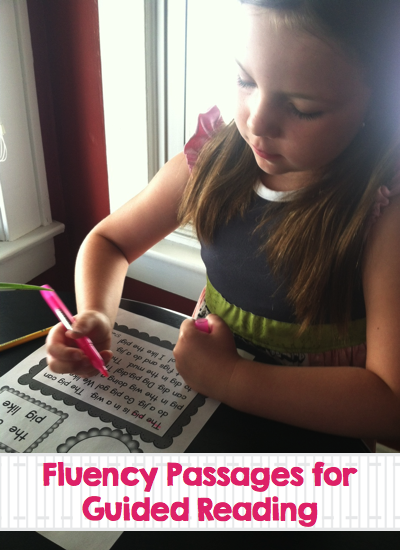 Tina over at Warm and Fuzzy in First Grade had a great reading fluency packet that she uses during guided reading time. 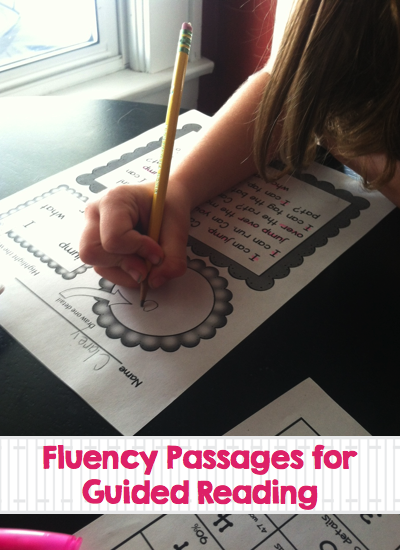 It even has a rubric that goes along with it so you can assess student with each passage! You can pick up a freebie sample of this product by heading on over to Warm and Fuzzy in First Grade's Facebook page and clicking on her tab at the top! You can pick up the whole packet by clicking HERE! Great post. This article is really very interesting and effective. I think its must be helpful and informative for us. 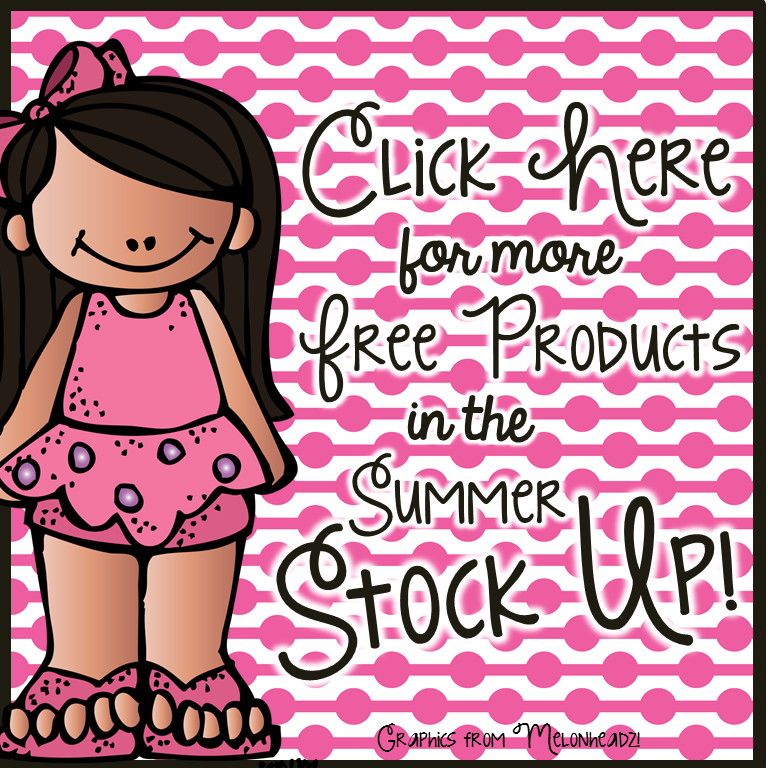 Thanks for sharing your nice post about Summer Stock Up .